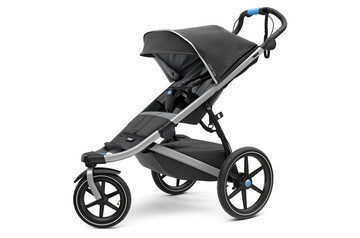 Thule jogging strollers are sleek and lightweight. Take your child on a walk around town or a run in the fresh air – always in safety and comfort. 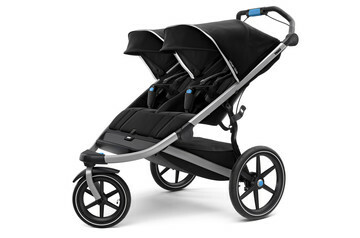 With Thule jogging strollers, you’re free to enjoy and share your passion for walking or running with your child. Whether you prefer a high-performance model for more serious runners or a more maneuverable all-rounder to suit urban environments, you’ll find the perfect lightweight stroller for you and your child to enjoy your activity together. Safely, comfortably, and stylishly. Speed and performance? Or urban mobility? The choice is yours. You can go for a high-performance jogging stroller with an aerodynamic design, allowing you to get the most out of your run on any terrain, with a front wheel built for speed in a fixed position. 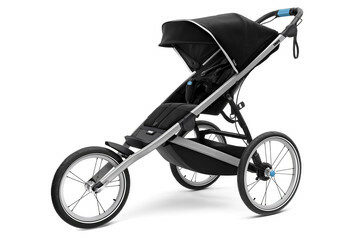 For urban areas or jogging on your favorite path, how about an all-round jogging stroller? The front wheel can swivel for easy maneuverability when you’re in busy areas, and there’s also a large storage compartment with a water-resistant cover. Our lightweight jogging strollers are designed and built for speed. But there’s nothing lightweight about the comfort and safety features. Your child gets a smooth, comfortable ride thanks to the rear suspension and the canopy that protects them from the weather. Most importantly, every Thule stroller meets the most stringent safety standards with features such as a 5-point safety harness to ensure your child’s security.